In the first article published September 2017, the focus was towards how doubt could seep into a project without ever being discussed and more importantly become a driving force to undermine the project or change initiative success. Individual perceptions once impacted, tend to erode commitment to the project leading to a reduction of time and resources applied towards successful completion. The exponential effect of this often unrecognized and unspoken process is that it becomes an unconscious collective action that ensures failure or less than desired results. In this article, we examine self-doubt and its impact on successful project completion and change initiatives. We will examine the abductive (best guess) logic often used to address and resolve the doubt, often diminishing the original commitment to the project. Because doubt and conviction (commitment) are so entwined (Srikantia & Pasmore, 1996, 42), not recognizing the daily internal struggles that permeates most projects or change initiatives can lead to the unseen, impending project failure indicated in Part 1, (Stevenson, 2017). Self-doubt is often referred to as the lack of self-confidence or trust in one’s abilities or self. It is implicit if not explicit in research on self-esteem, self-efficacy, trust, and the impostor syndrome. (Stevenson, January, March-April, & June 2015). If we move from self-doubt as simply an experience to self-doubt as a process, we begin to understand how it works, how it can justify our behaviors and perceptions, and more importantly can hide the creative adjustments made through abductive logic, often triggered by cognitive dissonance. However, because Western culture views self-doubt as a sign of weakness and potentially to be shamed for, it tends to be dealt with unconsciously. (Tannenbaum & Eisen, 2005; Niose, 2005) It seems that self-doubt is prevalent, yet the cultural message that it is not okay leads individuals to repress or deny their sense of self-doubt rather than accepting it as normal human experience that can be consciously examined to one’s benefit. This creates a double bind. (Berrol, 2006, 2) On the one hand, self-doubt is normal and on the other hand, it is shameful to acknowledge that it exists. Understanding how self-doubt is managed can provide insights. One method to garner insights is to apply self-doubt to cognitive dissonance. Sixty years ago, social psychologist Leon Festinger developed the cognitive dissonance theory (Festinger, 1957) It identifies the pervasive human tendency to rationalize our decisions and behaviors by eliminating any internal incongruence that creates the sense of dissonance. According to the theory, we all recognize, at some level, when we are acting in a way that is inconsistent with our beliefs/attitudes/opinions. (I will add to the list our commitments.) In effect, there is a built-in alarm that goes off when we notice such an inconsistency. For example, if you have a belief that it is wrong to reduce your commitment to a project without notifying leadership, yet decide to shift resources to another project to ensure getting a bonus, you will notice and be affected by this inconsistency. Once you recognize that you have violated one of your principles, according to this theory, you won’t just say “oh well”. You will feel some sort of mental anguish. The degree of dissonance, of course, will vary with the importance of your belief/attitude/principle and with the degree of inconsistency between your behavior and this belief. In any case, the greater the dissonance the more you will be motivated to resolve it. Dissonance, according the Festinger, will be resolved in one of three basic ways: (1) Change Beliefs, (2) Change Actions, or (3) Change our Perception of Actions. Perhaps the simplest way to resolve dissonance between actions and beliefs is simply to change your beliefs. You could, of course, just decide to ignore the commitment to a project or change initiative. This would take care of any dissonance. However, if the belief is fundamental and important to you or the leadership such a course of action is unlikely. Moreover, our basic beliefs and attitudes tend to be stable and support our sense of identity. Therefore, changing basic beliefs/attitudes/opinions and commitments, though the simplest option for resolving dissonance, it’s probably not the most common. To be as “rational” as possible— deﬁning clear objectives and evaluating behavior in terms of whether one has achieved those objectives. “The purpose of these values is to avoid embarrassment or threat, feeling vulnerable or incompetent”. (Argyris, 1991, 6) In this respect, the locus of meaning that most people use to drive action is profoundly defensive. Defensive reasoning encourages individuals to internalize any doubt, premises, inferences, and conclusions that shape their behavior and to avoid testing them in a truly open, independent, objective fashion. Therefore, the double bind develops between the fear of shame or humiliation and trusting one’s doubt. A third and more complex method of resolution is to change the way the individual view/remember/perceive the commitment and action. Basically, one would rationalize, re-conceptualize, or reframe the discordant actions. For example, as indicated in the prior article, once doubt about a project occurs, it is common to take actions that become more self-serving. The tendency is to think about the project in a different manner or context so that it no longer appears to be inconsistent with your actions. The cognitive process, ironically, becomes easy to notice the reframes, re-conceptualization, and rationalization of behavior on the part of others, though it’s not so common to see it in one’s self. On the other hand, as indicated in the first article, if doubt is triggered within an individual or team through a developing perception that the project lacks real commitment from the organization as evidenced by what appears to be a change of priorities, dissipating leadership, questionable ability to deliver on the project, and/or questionable messaging that does not support the project, dissonance can develop between the individual’s sense of success and the project or change initiative’s success. After a successful stint in the military and adequate career success to feel competent, an executive was offered the challenge to lead the organization through a turnaround. Economic conditions had shifted to such a degree, defaults were increasing enough to lead the organization into insolvency and failure. Relying heavily on hands-on experience, the first 12 months were focused on reducing the losses at any costs. Along the way, it was realized that stemming the losses could not resolve the situation unless further internal controls and processes were developed to pre-empt losses. This required a completely different way of thinking for the executive. He was trained in directive instead of systemic leadership. Directive leadership is a “by the numbers, hands-on, micro-management model” that requires indepth expertise. It only works when all variables are known. Systemic leadership is a “bigger picture, pattern discovery, relationship understanding model” that requires reflection and deeper insight into how the pieces work. The realization, after painfully running as fast as possible from one source of loss to the next, was that the solutions were like sticking a thumb in the multiple leaks in a dike. The internal belief concerning what is competency clashed with the inability to stem the losses. A common solution would be to blame other’s in the organization, especially for not getting his bonuses, followed by taking harsher actions towards the direct reports and employees. Finally, instead of staying so granular, an emergent process, like an “ah ha” experience, created a new awareness that enabled being able to see the larger picture. The perception of the dissonance was resolved by having a completely reframed view of the situation. In the diagram below is a model to be used by leaders and coaches. This model focuses more on self-doubt that can occur from a habitualized life of eroding self-confidence as well as an executive facing an entirely new situation that does that not respond to tried and true solutions from the past. At the top of the diagram, self-doubt can act as an entrainment of one’s thoughts that leads to cognitive dissonance. This can feel like a tortuous broken record that repeats negative thoughts. To break the cycle, the leader (or coach supporting the leader) needs to heighten self-awareness and learn to witness the internal diatribe. This can be done by becoming curious, asking questions instead of dictating orders, increase the awareness of the actions taken that work and do not work, and begin to discover that there are many choices for solving the challenges, beyond what one has always done. Next the cycle can be broken by revealing that a false confidence was hiding a true sense of competence. Some call this the impostor syndrome1. The leader must develop an awareness and commitment to move into the dissonance to recognize there is a clash between one’s beliefs, actions and actual results. This means an honest assessment of looking at the beliefs, the actions and the perceptions of one’s actions. Typically, the perceptions of what is the “right” actions are where the leaders reframe must occur. The next step is to claim the right to create one’s own true perceptions of what it means to be a leader. This will reveal the self-doubt that exists. It is done by naming the uncertainty surrounding how to lead, then develop a deeper sense of self definition that goes beyond the present beliefs around being a good leader. This self-definition is often the first time the leader has reflected on how to be a true leader that has people wanting to be led instead of aggressively directed. 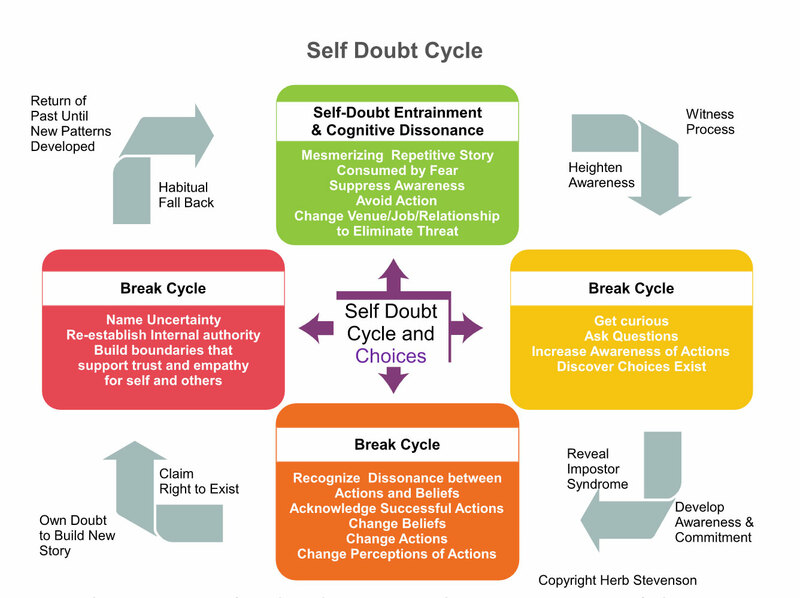 Throughout breaking the cycle, self-doubt will seep back into the mind-set often. Stressful moments will lead to regressive behaviors. It is only through steadfast determination and discipline that success will follow. The executive’s reframe of leadership became understanding that success is accomplished through informing, influencing, and relationship building. Instead of directing, he listened to others and learned to hear themes and to see patterns. He provided guidance on addressing the patterns and themes while the organization focused on the details of how to do so. The organization became solvent as a better stronger organization. Clance, Pauline Rose; Imes, Suzanne A. (1978). "The imposter phenomenon in high achieving women: Dynamics and therapeutic intervention." (PDF). Psychotherapy: Theory, Research & Practice. 15 (3): 241–247. doi:10.1037/h0086006. Festinger, Leon & Carlsmith, James M. (1959) Cognitive Consequences of Forced Compliance, Journal of Abnormal and Social Psychology, 58, 203-210. Srikantia, Param. Pasmore, William. (1996) Conviction and doubt in organizational learning. Journal of Change Management. Vol. 9, No. 1. 42-53.